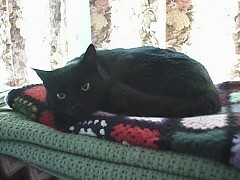 Darcy lives in Victoria, BC at the Crow's Nest Bed & Breakfast with two other kitties: Long John Silver and Cassidy. He also lives with a dog named Isby. He was picked up from the SPCA as a 31st wedding anniversary gift, along with Cassidy. They were both born around 1995. Darcy keeps to himself mostly, preferring the blankets and cushions of the master bedroom to the sociability of the living room downstairs. But when bedtime comes he likes to snuggle on the bed with his owners. Note: Darcy passed away in November of 2004. He will be able to play again with Long John Silver, but will be missed by Cassidy and his other friends.